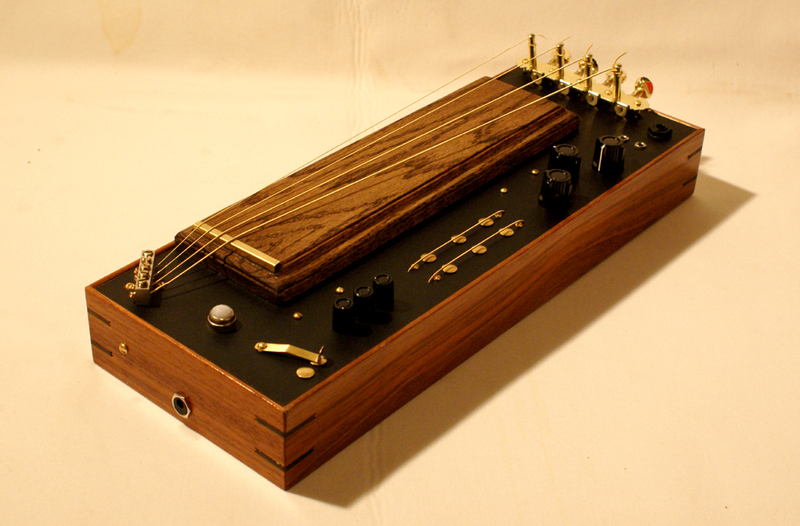 The Mobius is a concept piece designed to allow the playing of an acoustic sound source in an electronic way. 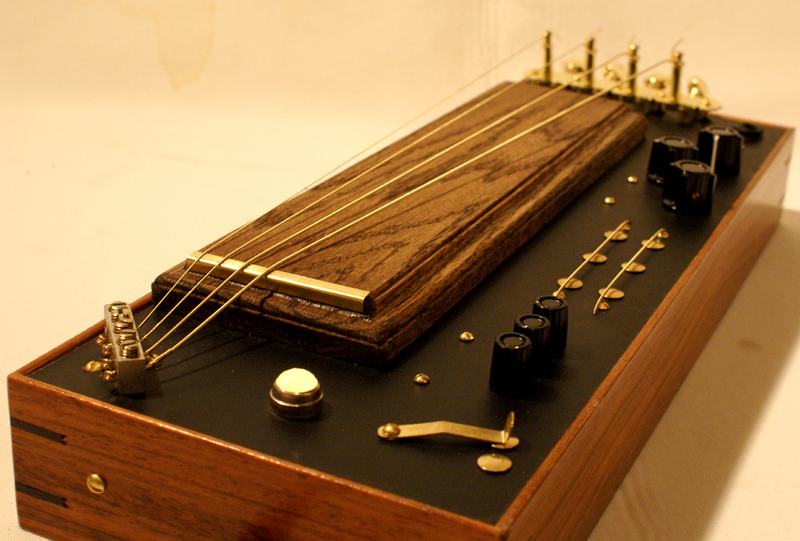 Essentially, synthesis from acoustics similar in nature to the way the Folktek Garden series generates lush waves from micro sound. 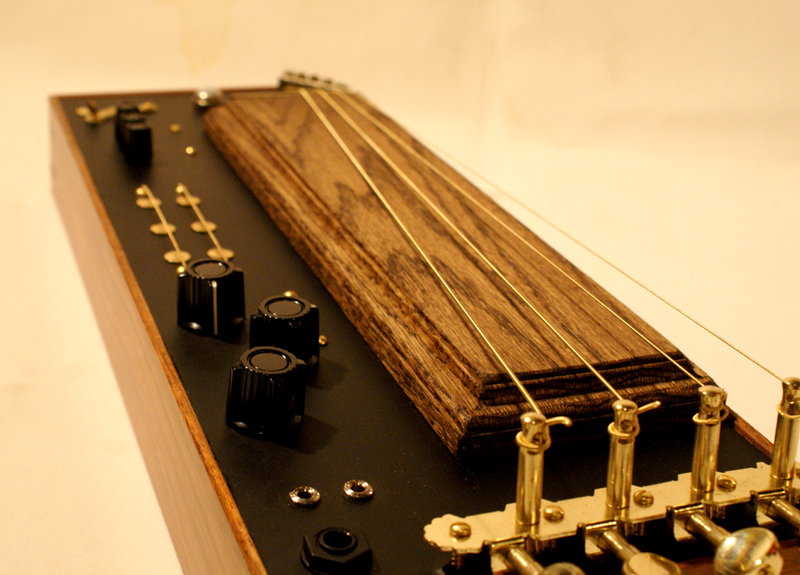 The Mobius features four strings with a fretless soundboard driven into a delay capable of extremely tight, notated delay, to about a second and a half of near endless looping. The delay travels into pitch shifting, out to an amplifier that runs an internal spring reverb and back into the delay. The pitch shifter can subtly or drastically shift the pitch to a great degree and has six playable keys designed to shift the incoming signal. Keys are additive so playing more that one at a time results in different pitch arrangements which allow for different combinations of pitch control within the master pitch (controlled by a master pitch knob). The original signal from the delay can be mixed with the shifted signal for more harmonic dynamics or played dry all together. The spring reverb is not an overwhelming reverb but is instead designed to add depth and resonance to the sound - creating deeper, crystalline waves or generating waves of feedback. In longer delay modes where the repeats are near endless, the reverb will swell with each repeat, which generates, for examples, gradual waves where there once were very specific strong attack notes. Play with a bow adds an entirely new sound and dramatasizes the reverb feedback. There is an independant level control for the amplifier that runs the spring reverb. In addition, there are 1/8" CV (+5v control Voltage) jacks to control delay time and pitch to synchronize with analog/modular synthesizers.